The Lost Medallion Beneath the Hill of Endor is a Temple Inside the Temple is a Chamber, Inside the Chamber is a door, Behind the door … the abyss. And the key to the door is the witch’s medallion. Former sheriff Randy Baker steals the witch’s medallion. Using the Book of Incantations, he summons the powers of darkness to open a passage which takes him in search of the Temple of Endor in Israel. 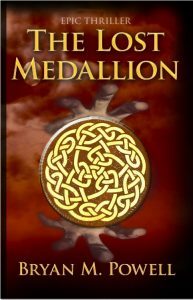 His intentions … to use the medallion to unlock the door to the abyss and unleash legions of evil spirits. Knowing they only have days to stop the former sheriff, the three wise men follow him. Unbeknownst to them, Colt O’Dell stows away in the cargo hold of their flight. Once in Israel, the four of them race into action, but quickly find themselves caught in a desperate battle for their lives. Top-selling author Bryan M. Powell adds yet another gripping novel to his impressive list of Christian Fantasy spell-binders. He once again peels back the veil and gives his readers a glimpse at the spiritual war being waged over the souls of men. Using tragedy in the lives of his characters to demonstrate the power of faith and forgiveness, he skillfully weaves a captivating tale that builds to a breathtaking climax. If you liked Frank Peretti’s This Present Darkness and Piercing the Darkness, you will love The Lost Medallion. A pair of green orbs peered through narrowed eyelids at the little boy. The demon’s breath came in short, angry huffs. Drool formed in the corners of its gaping mouth and hung like froth from a tired race horse. Were it not for the Holy Spirit’s seal which he placed upon Colt, the creature would have sunk its talons into Colt’s head long ago. As it was, each time he attempted to read the engravings, he became more ill.
He’d found the ancient disc in the witch’s cave several months earlier and ever since, guarded his secret from all comers. His parents, not even his closest friends, the wise men, were aware he possessed the relic. Something about the disc called to him, spoke his name and he spoke to it. As a wave of nausea snaked through his stomach, Colt wrapped the disc in an old cloth, tucked it between the two mattresses and flopped in bed. He spent the next two hours in a dreamlike state … caught between light and darkness … caught between opposing forces. Shadowy figures with clawed feet and leathery skin attempted to grab him and drag him into the night, while bright, shining beings surrounded him, holding the raging creatures at bay. He stood atop the exalted pedestal overlooking the sacrificial chamber where swords clashed and the screams of dying men penetrated his ears. He was back in the Witch’s Cave. The deep rolling echo of thunder shook the earth beneath him nearly knocking him from his perch. All at once, excruciating pain shot through his head. He turned and saw himself standing a short distance away. His slingshot dangled loosely from his hand … a wicked grin spread across his face. Seemingly in slow motion, he watched himself reload and fire again and again. His feet slipped. Falling … he was falling. Sitting upright, he threw off the covers which ensnared his feet and realized it was only a dream … one he’d had before. One he feared he’d have again.